Ever wondered who's behind @avantgardevegan's instagram and sensational you tube account? Gaz Oakley the incredible chef and entrepreneur really has made waves in the vegan food scene, read all about his road to success here! What’s the most valuable thing that you’ve learnt from working in a high end restaurant environment? Too many lessons to mention, timings, cleanliness, the importance of mise en place, how to work in a team, the list goes on! Keep it simple, do the simple things well & everyone will enjoy it. You’re a busy man! What do you eat throughout the day to keep you going? I find it very difficult when I’m travelling to eat well, but when I’m home I like to meal prep. Simple whole foods. However I am always testing recipes so there’s constantly nice food around. What were some of the biggest challenges you faced in the early days of going Vegan and how did you stay motivated? Of going vegan? Generally just the lack of options of convenient food in shops, restaurants & supermarkets. But now its so much better! Veganism has come a long way since 2016- what’s the current stance on plant-based cooking at high end restaurants, how is it viewed? I am not to sure to be honest, I try and eat at only vegan restaurants. I would like to think they are making a conscious effort to add more vegan dishes to their menus. How many takes do you have to do before you get a video right? Are you a one take wonder or do you end up cooking the same thing multiple times? It used to be a LOT, and filming would take hours, but I’m just embracing my mistakes now, so if I mess up I just carry on. Its more natural..more me. What’s your favourite dish from your #VEGAN100 recipe book? My favourite dish is either my Pea Veloute or Sriracha meat balls! So tasty & simple to make. What piece of kitchen kit could you not live without? My powerful blender!!! For sure. You must have faced some culinary disasters in the past- what’s the worst thing you’ve ever made? Oh I’ve never made anything terrible, I have always had a knack for cooking good…its just my thing…but like everyone I do make mistakes or get distracted & burn stuff!!! Do you have any tips for someone that might be planning a vegan dinner party for their friends? Keep it simple, do the simple things well & everyone will enjoy it. What’s your favourite place that you’ve travelled to for food? Los Angeles, for vegan food. 3 biggest tips for building a business using social media? Describe your perfect day in London? Perfect day in London would have to involve popping into get a gaz burger from The Vurger Co & then a hang out in box park. If you could give 14 year old you some advice, what would it be? Start a youtube! I wish I started sooner - although back then all I wanted was to become a chef & I did! Favourite ingredient is plantain, and just simply fried in coconut oil. Beautiful. THANK YOU SO MUCH to the amazing Gaz Oakley! We have been fans from day one, your recipes are incredible and your book is out of this world, thank you so much for working so hard with us on this! 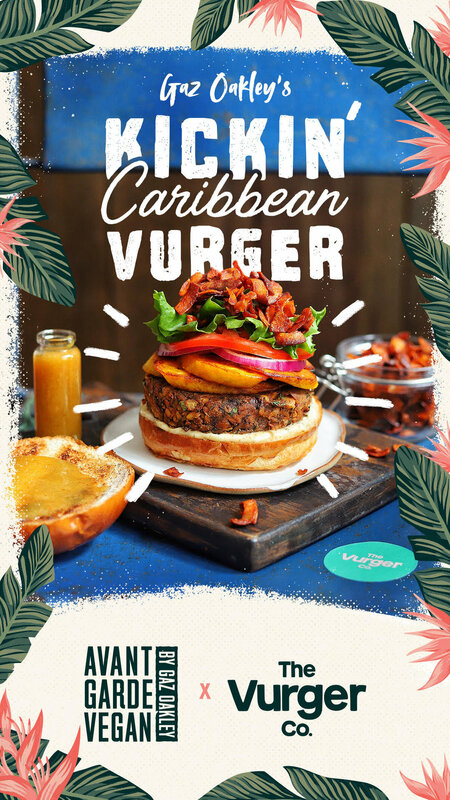 You will find the Gaz Kickin' Caribbean Burger on our menu throughout July, run before it's gone forever!